To drink Mornington Peninsula Pinot Noir is to contemplate an ancient volcano with a cool sea breeze at your back. The Peninsula’s crab-claw like coastal stretch is washed by three waters; mild, gentle Port Phillip Bay, soupy, rough Western Port Bay and turbulent Bass Strait the lifeblood of vineyards and tasty, supple wines, tense with tannins and alive with acidity. Across this region, winemakers learn and better understand the rich diversity of the landscape through the lens of the Pinot Noir grape. Their wines reflect volcanic loam in vineyards bound by sea and bathed in bright sunshine. Filmmaker, Fred Schepisi grows Pinot Noir in Red Hill while across the ditch, his old mate, New Zealand actor/winemaker, Sam Neill hugs his pig while making Central Otago’s brooding and sorrowful wine. The sun is a stark signature of the Australian cinema that these men help create and just as terroir is traceable in wine, brilliant light provokes a sense of place in films shot in this hot and fragile land. As film lovers we watch cinema from all corners of the globe. As wine lovers, we feel privileged to drink foreign made wines. As they have piqued our interest, the French have owned our palate with Burgundy wines of density and perfumed grace. French cinema explores psychology through images shot in soft, diffusing light. The cultural existence the sun plays above has Mornington Peninsula wine expressed as bright Pinot Noir with burnt berry scent, cherry-fruit and soft and silky tannins. The hills around Main Ridge to the sea feature fertile volcanic soil formed by granulated tephra forty-five-million years ago. Today they are bathed in sunlight as brilliant as a cinematic spotlight over land. Winemakers dream of making greater wines, but they can’t just dial-up Chambertin, as these coastal slopes bear little resemblance to the revered Côte d'Or. Imitating Burgundy is not an honest interpretation of Mornington Peninsula terroir. Winemakers should seek a pure expression of complex soils, salty air, and hot summer days. Pinot Noir with energy and complexity defined by a gentle sea breeze, bright fruit and sunshine in a glass. Close-planted Pinot Noir vineyards are the colourful kite surfers of the wine world- they’re expensive and complicated to run but, in ideal conditions, the results can be mesmerising. Driving around the Mornington Peninsula, there are close-planted vineyards at Merricks Creek (est. 1998) and Ten Minutes by Tractor (est. 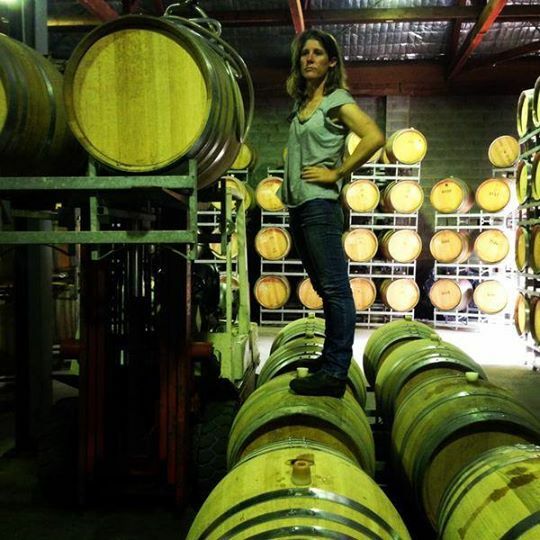 2016), while a tour of Victoria finds the typically stumpy vines planted at Punch Vineyard in the Yarra Valley, Bass Phillip in Leongatha, Bindi in the Macedon Ranges and at Australia’s oldest close-planted vineyard in Bannockburn. Here, the Serré Vineyard (est. 1986), produces one of the country’s most celebrated Pinot Noirs with superb length and energy. Its fruit density and savoury tannins formed from whole-bunches means it’s a wine comparable to Cru Burgundy with great ageing potential. Turning off the water plays a critical role in a close-planted vineyard’s success as dry grown vines limit yields and increase fruit intensity. Amongst Burgundy’s Grand Cru sites, the old vines at Domaine Dujac’s, Clos de la Roche in Gevrey-Chambertin reign supreme. This vineyard is capable of producing wines of beguiling complexity. In the New World, close-planted vines typically produce wine with more power as the vines age. In younger sites, such as those on the Peninsula, the rich volcanic soil and coastal climate presents extra challenges. Dense foliage and tight bunch frames are prone to disease pressure like powdery and downey mildew from ocean-borne humidity which also increases weed activity and vigour. Also, the back-breaking task of picking grapes along knee-high vines in high humidity is a job few would ever wish for. Forever chasing the holy grail of Pinot Noir, the vast majority of Mornington Peninsula vignerons have trellised their vineyards with Vertical Shoot Position (VSP) but a small band of resistance farmers have opted for a more interesting post and wire configuration. The V-shaped Lyre trellis, which straddles vineyards in Main Ridge, Red Hill and Merricks is most distinctive for producing wines with plenty of intensity and power. Across double-spaced rows, a broad and airy canopy reduces disease pressure and filters sunshine to ripen fruit slowly. At the vine’s base, the trunk is split close to the ground ensuring short arteries deliver nutrients closer to the source. Paringa Estate’s The Paringa, (est. 1989) and Stonier Wines’ KBS Vineyard (est. 1985) are two of the Lyre’s finest work. 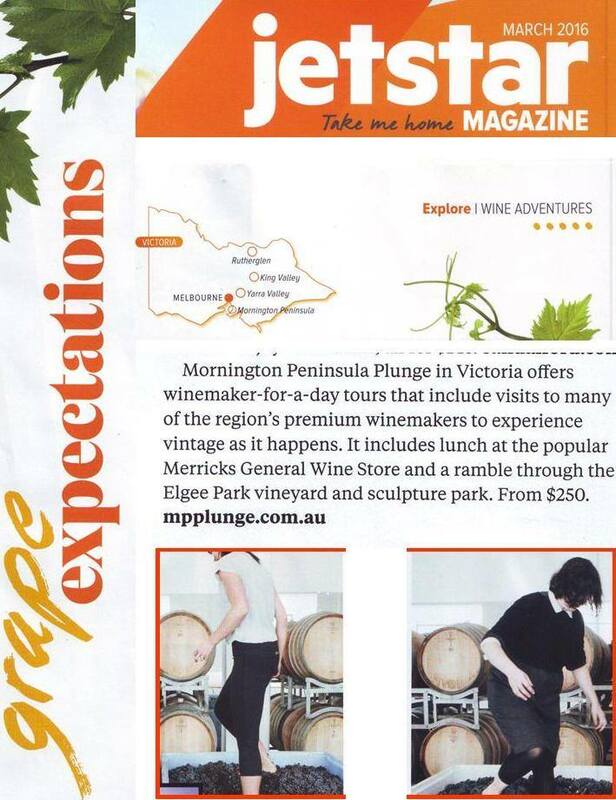 The Paringa having received many trophies and acclaim from wine shows and critics in Australia and internationally. Once they reach maturity, it will be interesting to see how the close-planted vines stack up against these local wines grown on the big V.
Ex-Lord Mayor of London, Rt Hon Dr Andrew Charles Parmley and his wife took the Plunge on a sunny summer's day in mid-January. Andrew is President of the Worshipful Company of Vintners in London. With over five-hundred members, and founded in 1363, the Company's origin is steeped in the history of the City of London and the import, regulation and sale of wine. The Company continues to maintain strong links with the UK Wine Trade. Vintners' Hall is known as the London Wine Trade's spiritual home. Amongst the people Andrew met was Stonier Winemaker and CEO, Mike Symons who explored the possibility of hosting the renown Stonier International Pinot Noir Tasting at Vintner Hall next time it travels to London. There is a moment when the spirit of the vineyard is revealed. One may think one knows wine and yet, on this day, one truly discovers it. Out on a perfectly still autumn day, two couples on a tailor-made wine-lovers tour dropped into a few wineries to taste freshly minted 2018 Mornington Peninsula Pinot Noir. Tasting young Ocean Eight and Principia Pinot Noir out of barrel brings focus to winemaking styles; structure, aroma and flavour. But young wines drawn from their oak treasure chests also provide insight into the growing season and the terroir of the vineyard. These wines (both MV6 clone) showed traits defined by their unique terroir. 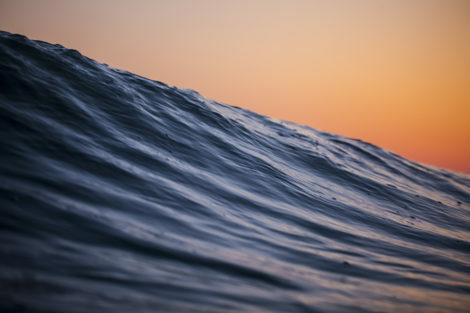 The Ocean Eight exhibited a perfumed, plucky cherry character while the Principia was richer, dark fruited and more succulent. These differences can be traced to the warmer, seaside down-the-hill site and the cooler up-the-hill Main Ridge vineyard. When these Pinot Noirs are bottled, they are sirens for the place from where they came. Throughout the journey, terroir is a fascinating stamp on a distinctive regional character of lighter, elegant Pinot Noir. Plunge Wine Tours delve deeper into the Mornington Peninsula to reveal the secrets of the cellar, the vines and the wines. On a Plunge wine tour, the smallest detail takes on special importance. When Arthur O'Bryan commits to taking you on a private tour for one or two people, he won't ask you to share your adventure with others. This is vital, as every Plunge wine tour is driven by the creativity engendered by years of focussing on customers' needs first. The heart of the region's charm is in rarity. In a world where profusion is synonymous with mediocrity, Plunge Wine Tours look to what is unique and create a day's adventure which in itself is like no other. Arthur actively seeks wineries that offer exclusive experiences or are of such high-quality, they can't be ignored. Many winemakers are his friends, adding to the joy of the day. There is a focus on regional produce: Cheese from local dairies, olives from local groves, oil, and bread from local producers and bakers. When guests sit down to feast, the highest quality ingredients are enjoyed, sourced from across the region. Plunge Tours' independence is its freedom. The secret of this freedom is summed up thus: "Every decision throughout a tour is driven by a single priority, the quest for absolute quality and our guests' enjoyment. This is the pathway whereby a wine tour becomes an unforgettable adventure." If the recent explosive growth in whole bunch fermented pinot noir is anything to go by, lovers of dark flavours are being well rewarded by a modern take on an ancient craft. Devotees say it adds perfume, density and tannin, while some say potassium in the stems adds liveliness but dilutes colour and even suggest that wines from cooler vintages benefit more than those from warmer ones. With increasing interest in whole-bunch Pinot Noir, today, up the hill, down the hill and across the plain there are plenty of older sites (vines 20+ years) producing excellent wines to taste. Good examples include: The Stonier Windmill from Merricks, Garagiste from Balnarring, Nazaaray from Flinders, Prancing Horse from Red Hill, Dexter from Merricks-North, The Garden from Moorooduc, Zuma from Crittenden’s in Dromana, Willow Creek O’Leary from Balnarring, Principia Altior from Main Ridge, and the Yabby Lake Single Vineyard from Tuerong. Before this new wave of whole-bunch obsession, Stonier Wines were focused on vineyard typicity and site expression with its monopole program that began in 1999. The unique terroir of the Windmill vineyard led the winemakers to include eighty per-cent whole-bunches to the 2003 Stonier Windmill Pinot Noir. So attractive was this wine in barrel, they decided to add a portion to the 2003 Stonier Reserve blend as well. At the annual Stonier International Pinot Noir Tasting held in Sydney in 2005, a gathering of two-hundred Pinotphiles saw one wine soar above the pack of Burgundies and New World Pinots. As the evening tasting concluded, James Halliday AM and Len Evans AO OBE celebrated a wine they described as: “Beautifully perfumed…that doesn't have the fingerprints of the winemaker all over it... a wine made in the vineyard.” The packed Wentworth Ballroom lit up when the hero wine was unveiled as the 2003 Stonier Reserve Pinot Noir. With twenty-five percent whole-bunches and a forty-five-dollar price tag, this wine outshone two Grand Cru Burgundies and soon achieved cult status in the Australian wine trade as 600 dozen were snapped-up in eleven days. 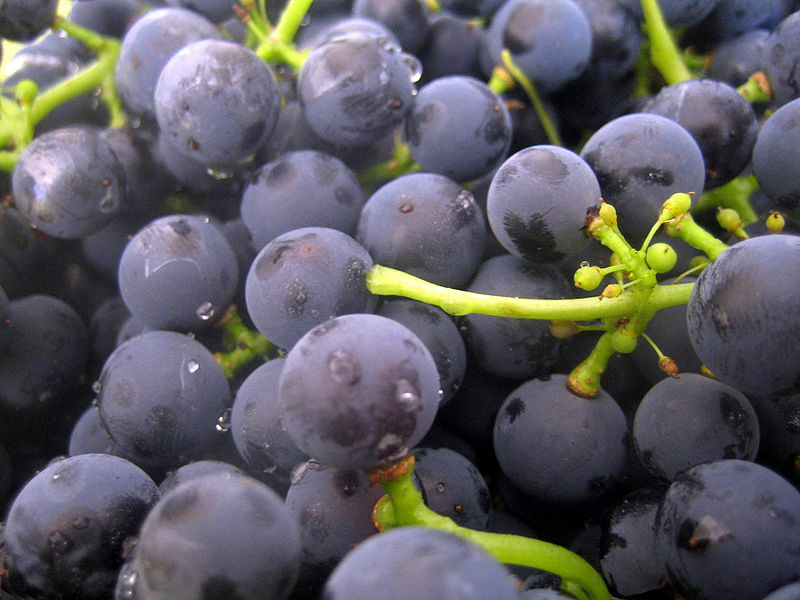 During vintage, nature puts a natural squeeze on pinot noir grapes when bunches are loaded into small, open fermentation tanks and allowed to go through wild yeast carbonic maceration. The whole-bunches then spend an extended time on skins as the gentle art of pigeage (French for ‘punching down’ or naked grape stomping) replaces a modern plunger to build colour and tannin. Whether they finish as ten-percent, one-hundred percent, or something in-between, tasting a 100% whole-bunch wine from barrel is not for the faint-hearted. In youth, these wines can look tight with an acid thread from which the tannin, oak, herbs and little berry flavours hang. In time, all elements will fuse into a highly structured wine characterized by far greater cellaring potential. The 2015 Yabby Lake Block 6 (fifty per-cent whole-bunch) is a beautifully balanced Pinot Noir that shines radiantly a few years after bottling, having achieved a silkiness and harmony with elements that were once separate – oak, acidity, tannin – now fully integrated with rich cherry fruit. This wine reveals herbal and dark berry flavours with smooth tannins of such length it suggests cellaring for up to fifteen years. Reminiscent of Burgundy, it's a wine of wild perfumed grace. On a Plunge Wine Tour, we can visit cellar doors on a day-long Festival of the Whole-Bunch. Micro-makers like Garagiste, Hurley and Principia are tasted along with wines from senior producers like Stonier, Crittenden and Moorooduc Estate. We visit vineyards and look at wines in their spiritual home and appreciate the complexity, depth of flavour and cellaring potential that whole bunches provide. Darrin Gaffy’s approach to winemaking is a singular pursuit of excellence. In recent vintages he has made complex wines that speak from the soil of his exceptional vineyard site in Main Ridge. Plunge visitors can’t help but be charmed by this gregarious man, Ralph his dog and his lovely wines. There are wine tours and there are gourmet experiences. There are tour operators who hang out the front of the cellar door strangling mobile phones with stale tobacco breath and there is Arthur O’Bryan, a regional authority who offers personalised adventures and wine commentary that goes way beyond your average cellar door crawl. After twenty years of thoughtful and questing wine tastings, Arthur knows what people like to drink. Knowing what to look for is the key, as there are plenty of wines out there but only a few truly great ones. As Mornington wine tourism matures, Arthur's personalised tours introduce visitors to a world where inside knowledge and contacts turn a day-trip into a fabulous wine adventure. Inspired by regionality and the synergy between local produce and wine, Arthur organises a visit to a winemaker's vineyard followed by a tasting in their barrel room. A short drive to Flinders and Harry’s mussel boat, moored at the pier, provides a feast of fresh mussels, cooked and served in a restaurant with other local delicacies and paired with the perfect chilled wine. After 20 years in the wine industry, Arthur sees himself as a facilitator for people wanting the finer things in life. “I aim to create unique experiences, so all people need do is relax and enjoy. They get in-depth knowledge and access throughout the region. She cruises the Victorian coastline; a rolling mass of salty cobalt curls and a powerful force that through the green fuse drives vines to flower, grapes to ripen and fruit to harvest. Bass Strait is a glorious wonder; an unpredictable crucible to the winemaker’s creativity. Her DNA flows deep throughout the land where her mark is grapevines sheathed in briny. Her tempest is a roller-coaster as fruit slowly ripens before winter’s cloak descends. Her maritime climate moderates the growing season; she’s the architect of a terroir that produces nervy Chardonnay and spicy Pinot Noir. Along the coast, a patchwork of slopes are sprayed and splattered by showers that give ancient soils energy to produce great wines. Bass Strait laps around the Mornington Peninsula. A crab-claw pincer of rich volcanic soils that produce vigorous growth and fruity, lightly-structured wines. There are plenty of nice wines here; plenty of spice, and fragrance but only a few have the strength of signal to be called great. Great wines dance to their own beat whether it’s a tango in a restaurant or a rave in the great outdoors. When people pass an evening together under the stars, they commune with nature, sharing wine where the spirit of place is stored and amplified. Great wine is a response to all the elements of nature’s majesty. The greatness of Bass Strait produces wines from the Mornington Peninsula that can be savoured anywhere you like. Seek out wines of individual vitality that engage both for food and for thought; wine released from volcanic soils surrounded by Bass Strait. 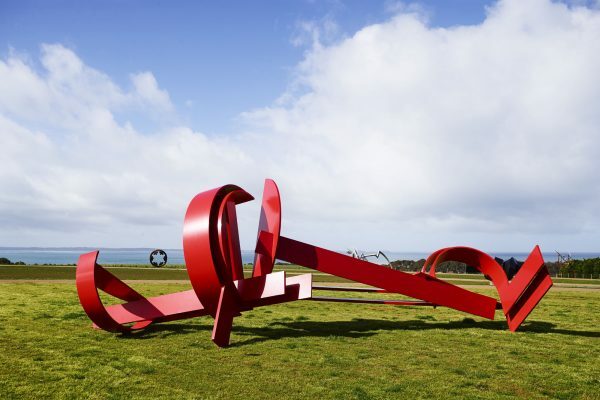 Owned by one of Australia's richest businessmen, John (Chaddy) Gandel, I managed to spring a private tour of Point Leo Estate before it opened (thus avoiding the $10 entry fee) to see the type of restaurant and sculpture Park $40million could build. The building is a concrete, glass and stainless-steel structure that rises toward the sea on a grassy knoll overlooking Western Port Bay. 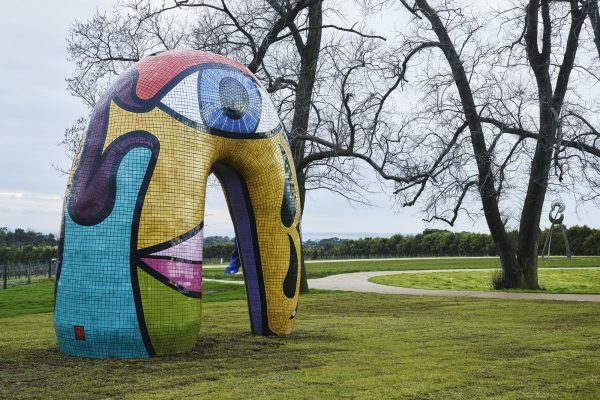 The surrounding vineyard and ornamental lake slope to the north of the restaurant's front which is dominated by a floor-to-ceiling curved glass wall that allows nature inside with views of the ocean and the surrounding sculptures. 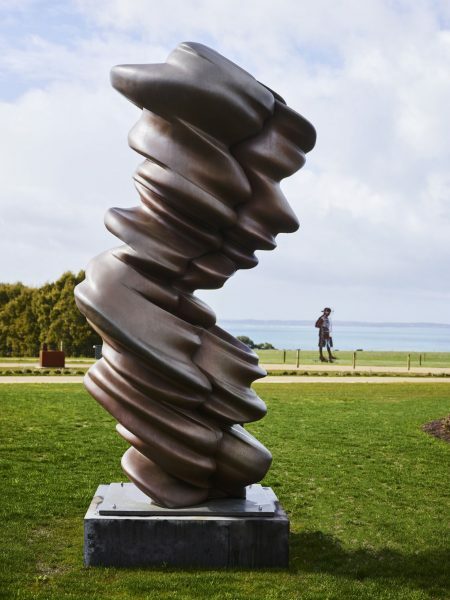 In the grounds are significant works by internationally acclaimed Australian artists such as Inge King, Clement Meadmore, Anthony Pryor, Deborah Halpern and Lenton Parr. 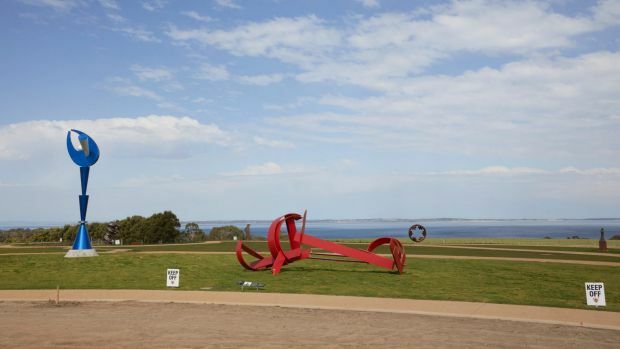 The permanent collection is displayed against the coastal backdrop. This really is an extraordinary place with the restaurant menu full of local flavours.